With entries now open for this year’s Energy Saving Trust Fleet Heroes awards, we take a look back at the innovations that earned last year’s winners top honours. In 2005, the University of Birmingham – the UK’s fourth-largest university – set out ambitious plans for a 20% reduction in carbon footprint by 2020, versus a 2005/6 baseline level. And, despite growing its student count since, a progressive attitude to travel means not only has it been ahead of the curve with alternative fuels, but it’s reached its target four years early. The scale of the operation is vast; the university has 45,000 staff and students and a diverse fleet of 100 cars and light commercial vehicles – the latter comprising around 80% of the total and used for everything from catering, postal service and maintenance duty. Responsibility for these now lies with a single department, and its proactive head of fleet and sustainable logistics, Monica Guise. In turn, this has enabled the institution to take a co-ordinated approach to travel, particularly with early adoption of alternative fuels. The university’s first electric vehicle was deployed in 2007, and a hydrogen fuel cell barge followed a year later, supplied by an on-site hydrogen filling station which supports the university’s Centre for Fuel Cell and Hydrogen Research. 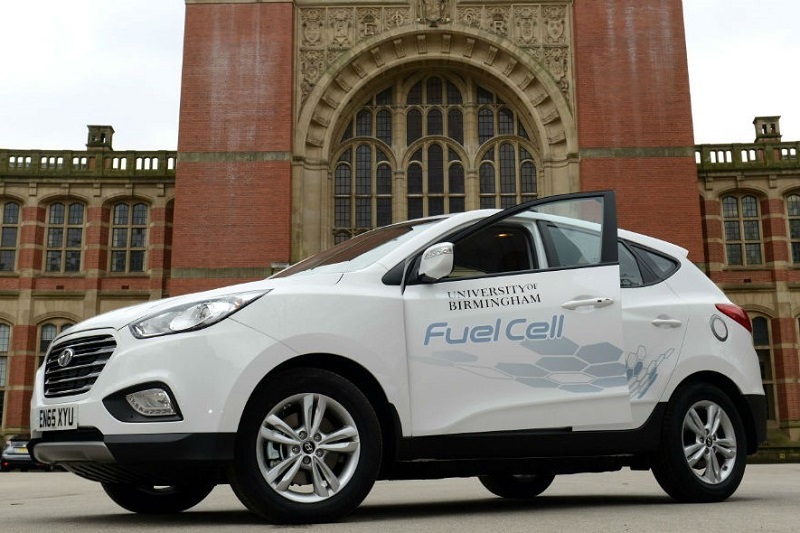 Hybrid, electric and fuel cell vehicles now account for over a quarter of the fleet, and are as much part of the working life of the university as conventionally-powered models. These include a Hyundai ix35 Fuel Cell, leased through Lex Autolease and used for staff transport and as a chauffeur vehicle for visitors. Electrification is only part of the picture. The university is using telematics to find where vehicles are idling unnecessarily, and it’s scheduling work trips to avoid rush-hour traffic, cutting both CO2 emissions and running costs. It’s helped cut business travel CO2 emissions from 367 tonnes per annum in 2005/6, to 238 tonnes in 2016/17 (-42.6%), with the results recognised at last year’s Energy Saving Trust Fleet Heroes Awards, where the university was named Best Business Sector Fleet. But the work is ongoing. With over a decade of real-world data to report on, Guise has become a familiar speaker at events country-wide, and staff are encouraged to help test vehicles and – via a salary sacrifice scheme – they can buy their own. With a target of 40% alternative fuel vehicles on fleet by 2020, it’s on course to stay ahead of the curve. Taking place on 27th November, The Fleet Heroes Awards seeks to recognise the organisations delivering cleaner, more efficient fleets through innovation, technology and fresh approaches to transporting people and goods. To enter, submit your application via http://fleetheroes.org.uk/enter-now before 1 October.